Physical Description Benjamin is a man who makes more use out of the different variations of Starfleet uniform than most officers, making use of the duty uniform, Captain's vest variant, training uniform, simple Starfleet-emblazoned fatigues, and the various away team speciality uniforms, among the most-utilised. He can also sometimes be seen with a pair of half-rim glasses, as he is allergic to Retinax V, the typical treatment for vision-correction and is ever-so-slightly far-sighted. Occasionally, he chooses to wear his glasses when he doesn't actually need them, as he has found that in some cases, it can be more beneficial to his goals if he presents an intellectual appearance. General Overview Benjamin comes across at first as a care-free and joyous man, for that indeed is the kind of man he is. Often preferring informal conversations with his officers, treating them often like close friends, which he has become accustomed to them becoming, he is one of the COs of the fleet who is much loved and respected by those he commands. However, this does not mean that he cannot be serious when it is needed, and is also a skilled tactician, winning a number of battles during the Dominon War aboard the Hendrix. He is also not afraid to discipline his officers when he feels that they deserve to be. Strengths & Weaknesses Strengths: Strong diplomatic instinct, inspirational speaker, good aim and hand-eye-coordination, strong grasp of linguistics. Ambitions Benjamin has attained his main ambition; to command a starship, though before he transferred aboard the Endeavour he never truely knew how much he wanted to command a ship as grand as the Sovereign class. His next ambition is to reach the rank of Captain, and conduct at least 10 First Contacts. Hobbies & Interests Benjamin has had an interest in archaeology and foreign languages and linguistics since he was a child, accompanying his parents on their digs around the world. This interest in Earth languages later expanded out into interest in alien languages too when he joined Starfleet, and he set about learning a number of them. Family Byrne's immediate family was a close-knit group, thanks in large part to the actions and dedication of his father, James Byrne. Byrne the elder had been affected emotionally by the rift in the family that his own father, Robert Byrne's Starfleet service had caused; with the family living full-time on Earth, Robert Byrne was rarely closer than subspace communications range to spend time with his family. On the few occasions where he was on Earth, he spend most of his time at Starfleet Headquarters in San Francisco on "urgent business" - the nature of which young Benjamin was never made aware of. James and Annika Byrne were both devout archaeologists, primarily studying the artefacts and ruins still to be discovered on Earth, but occasionally going out on long-distance digs as well as part of a larger expedition. It was because of James' dislike for Starfleet and his implied expectation of his children to follow him into the world of archaeology that Benjamin and his younger brother, Thomas, were initially hesitant to approach their father about their desire to join Starfleet themselves. The Byrnes were good parents however, and more than anything wanted their children to be doing what they wanted to do with their lives, and supported their decision and desires. Thomas Byrne is a year younger than Benjamin, though both joined Starfleet at the same age, both entering into the field of tactics. Thomas was always the more gung-ho of the two brothers, and through the years has stuck with his field of speciality, making his way through various assignments to finally work as an attaché within Starfleet Security on Earth. He keeps in regular contact with Benjamin, being the primary source of information on his family back home, and feeding him odd bits of information and rumours he hears from within Command that he feels would be of interest to his older brother. Elizabeth is the next eldest Byrne child, 4 years younger than Benjamin. Elizabeth was torn between a desire to follow her older brothers into Starfleet, and to continue the intellectual work she did with their parents, and so decided upon a mix of the two fields, enrolling at Starfleet Academy in 2365 with a focus in the sciences. Whilst on leave with Thomas in 2370, it was the two eldest of his siblings who introduced Benjamin to his future wife. Natasha Byrne is the youngest of Benjamin's siblings, 6 years younger then Benjamin, and the only one to remain at home, working closely with their parents in archaeology, except for a brief respite of a few years whilst she studied for her degree in the field. Over time, she has become the one that their parents are closest to, due to their sheer proximity to her and the fact that she works with them almost every day. The youngest Byrne though is not one of Benjamin's siblings; it is his son. Jacob Byrne, born 2378, is the proud result of the relationship that Benjamin shares with his wife, Sarah. Having spent almost all of his life onboard starships, young Jacob has become very self-reliant and self confident on his father's ships, though the boy is often closer to his mother than his father, due to the extensive duties of a starship captain. Benjamin has not had much contact with Robert Byrne since he was a child, or indeed even then. Robert Byrne was a starship captain himself, but became estranged from the family years previously. Benjamin had always felt a small desire to speak with his grandfather about his own accomplishments in gaining a command, but the eldest Byrne hasn't been heard from since shortly after the end of the Dominion War, and efforts to try and track him down have failed. In 2368, a new science officer was assigned to the USS Pacific; a woman by the name of Diana Crix. Diana was a beautiful young woman, and amazingly intelligent, if a little more unreserved and forthright when it came to interacting socially. She and Benjamin soon became very close, and over time their relationship evolved into an intimate one. The relationship between them lasted for two years, though the pair of them faced the first officer on more than one occasion in order to receive slight reprimands for inappropriate behaviour whilst on duty, including one singular visit to the captain. The two however were allowed to continue their relationship, though it came to an abrupt end in early 2370. Benjamin had been granted a reprieve from his shift early, as he had been planning a special dinner for he and Diana, when he walked into their quarters to find her deep into a covert conversation; the individual on the other end was easily identified by Byrne as a member of the Romulan military; Tal Shiar he had later assumed. Byrne immediately confronted her about it and its implications, and the Romulan agent - whose real name was T'Marl - was forced to reveal herself, stunning her lover of two years in order to make her escape. Starfleet was never able to catch T'Marl, as she fled almost directly into Romulan-controlled space, whereupon all known contact with her and any member of the Federation ceased. The revelation caused Benjamin a lot of emotional pain, and he spent a number of months serving Starfleet back on Earth, in order to spend some time with his family whilst they helped him cope. Benjamin and Sarah met almost a year after the incident with T'Marl, introduced by Benjamin's younger siblings, Tom and Elizabeth in an attempt to bring some energy and motivation back into their eldest brother's life. Benjamin was sceptical about their plan and their motives at first, but agreed to meet with Sarah. The pair hit is off on their first meeting, and were easy company for one another. Sarah was a teacher by profession, and was fascinated by all of the new discoveries that Benjamin had made and would go on to make in Starfleet. When Byrne was made an offer by Captain MonRoe of Antarctic to assume the position of his first officer with a promotion to Lieutenant Commander upon the emergence of the Dominion threat in 2371, it was Sarah who convinced Benjamin that he should take the posting. Benjamin was reluctant to leave his new love however, and made her promise that she would join him and live aboard the Galaxy-class starship with him. When war broke out with the Dominion two years later, and Benjamin was offered command of the Hendrix, his only conditions of acceptance were that he take Sarah to a world strategically unimportant to the war, and thus safe from the Dominion's advances, and that she marry him; an act which they performed on the ocean planet Pacifica a month later. Their honeymoon was delayed until after the war, as the Hendrix was desperately needed on the front lines. Sarah and Benjamin were reunited after the war's end, when she once again came to live with him aboard the Antarctic. Sarah became pregnant with their first son three years later, when Benjamin was offered his first real command onboard the USS New York. Though the Nova-class was too small to have been designed with families in mind, the Byrnes' captain's quarters were just ample enough for the young family to occupy comfortable. Upon the New York's destruction, the family trio moved onboard Benjamin's latest command; the Sovereign-class USS Endeavour, into much larger quarters, more suitable for a family. Captain Alan MonRoe is one of Byrne's oldest friends in Starfleet. The two met in 2371, when MonRoe was searching for a new first officer candidate, and came across Byrne's file. Whilst the USS Antarctic was in orbit of Earth, MonRoe made the offer to the then-Lieutenant, who accepted and came aboard with the new rank of Lieutenant Commander, even though it took some persuading by Byrne's future wife for him to accept the offer. Though the two officers never spoke of Byrne's personal past, as their friendship grew over the following two years, they shared details of their current personal lives, and often shared meals together with Sarah, who had come aboard the Antarctic to live with Benjamin. The friendship between the two men grew along with their respect for one-another as they together helped the Federation prepare for war. When Byrne was offered command of the USS Hendrix, MonRoe piloted the shuttle that took the two men and Sarah to Pacifica, where Byrne married Sarah before leaving for the war effort - though Benjamin confessed that his brother, Thomas was his first choice, MonRoe served as best man for the small and rapid wedding ceremony, and piloted the shuttle that returned the two men to their ships. MonRoe also offered several of the crewmen of the Antarctic to fill the rosters of the Hendrix, and maintained contact with Benjamin throughout the duration of the war; the two kept each other apprised of the goings-on aboard each of their ships, and shared as many of their mission details as they were able to. Benjamin also spoke with MonRoe first whenever seeking advice in how to deal with a command situation he was unsure of. When Commodore Gates broke the news to Benjamin that he wouldn't be offered another command yet after the destruction of the Hendrix in orbit over Cardassia at the end of the war, it was MonRoe who immediately requested that Benjamin transfer back aboard the Antarctic to serve as first officer once again; the Antarctic's war-time XO had requested retirement at the war's conclusion, creating an instant opening. Even after the following three years that they worked together as the ship's command team, the two maintained contact after Benjamin was offered command of the USS New York, and in to his command tenure of the USS Endeavour. Whenever MonRoe visited the Endeavour, he and Byrne would always trade jokes about the state of each other's vessels. Commodore Richard Gates first became acquainted with Benjamin after following up on several reports from his captain during his service as first officer on the Antarctic. The flag officer recognised the potential in Byrne, and began following his career closely. With the Antarctic assigned to Gates' Task Group, the two had plenty of opportunity to meet, and Gates took on a small mentoring role on the developing command officer. It was Gates who made him the offer to take command of the USS Hendrix, and fought to keep him there during the war, despite the objections of the other Admirals at Command. Personal History Benjamin James Byrne was born in 2344 to James and Annika Byrne in Vancouver on Earth. His distant ancestors were originally from the Irish O'Byrne family of the 11th century, though a direct lineage is difficult to ascertain. Tradition holds in the Byrne family, and has for generations, that the first-born son of a marriage receive their father's first name as their middle name. James and Annika produced three more children in the next six years; Thomas, Elizabeth and Natasha Byrne. The Byrne children were all very competitive with one-another, as most siblings tend to be, and would often get into arguments with each other over trivial matters, especially during their earlier years. As they grew older however, they began to get along much more easily; helped mostly by the new, larger family house bought just outside of Vancouver in 2361, which had allowed each child to have their own room. Benjamin was 17 years old at that point and spent much of his time thinking about his future and what he wished to do with his life, and had by this point become especially close to his younger brother, Thomas, who was just under a year his junior. Despite the closer nature of his relationship with his brother, Benjamin had always looked after his younger sisters through their school lives as well. Benjamin had a strong idea in his mind that he wanted to join Starfleet throughout his teenage years, but he had avoided voicing his ambitions to his parents, most particularly his father for fear that he might disapprove of his choice. Both of the Byrne parents were archaeologists, primarily studying the many sites still being discovered on Earth even in the 24th century. It was a profession that James had taken up partly as a result of an extremely poor relationship with his own father during his latter teenage years, going on into his early twenties. Robert Byrne had been a Starfleet officer - a ship's commander at that - and though his family lived full-time on Earth, he was almost always light years away on an assignment, and in the few instances that he was staying on Earth, he was regularly being called in to Starfleet Headquarters on "urgent business", though Benjamin had never been informed what that business was, and likely neither had James Byrne. Benjamin told that the extensive amount of work hours that his grandfather had put in to Starfleet, and the absence that resulted from it had caused a rift to form between him and his son, which had then led to James' desire to distance his own life from Starfleet as much as he could, and to take his family with him whenever he went out on a dig. Benjamin had always found the digs fascinating, and had become quite the archaeologist and studier of history himself, even in his youth. Though he enjoyed the digs and found the history to be one of the most interesting and invigorating subjects he could imagine at the time, he knew that his ambitions truly lay out amongst the stars. Benjamin had learnt a year previously that his brother had felt the same way, and whilst the two brothers lay in the sand under a boiling sun on one of their father's digs, they decided that Ben would wait a year longer, and they would both apply to Starfleet Academy together. Starfleet Academy To his credit, when his boys told him of their plans, James Byrne showed them enormous support. As he told the two of them when they finally worked up the courage to talk to him, he wasn't fond of Starfleet or what it did to its people and their families, but he had never wanted to stand in the way of what his children wanted to do with their lives. When they left for San Francisco in 2362, he sent them off with a proud smile of his face. Though Benjamin had wanted to join Starfleet for some time, he didn't really have any idea of the discipline he wanted to study at the Academy, only that he dreamt of one day achieving command of a starship. Thomas, ever the action hero, went straight in for tactical training, while Benjamin took a while to decide. Eventually, he enrolled for courses with a mixture of tactical skills, diplomatic and galactic history elements, and science. His second year, however, he was forced to focus his studies more directly, and so followed his younger brother on the path to becoming a tactical officer. By the time the two boys had left the Academy in 2366, the eldest of their sisters, Elizabeth, had also joined the Academy, studying to become a science officer. Early Career Though the boys entered the Academy together, they weren't posted together, as Benjamin was assigned to the USS Pacific as a junior tactical officer, while Thomas went on to serve aboard Starbase 12. Benjamin soon saw action for himself, and was a member of an away team on a mission where the Pacific was investigating the mysterious disappearance of a research station full of civilians when a group of Orion pirates beamed aboard, and tried to take the valuable Starfleet officers as hostages to then sell on to the highest bidder. When the senior officer on the team, the chief of security, was killed instantly by a direct shot to his head after trying to negotiate with the pirates, Benjamin instantly took charge, tackling the nearest of the Orions, and causing enough confusion and commotion for him and the remaining officers to be able to subdue their would-be captors. After disabling the dampening field that the Orions had set up, the Pacific was able to beam up the away team members, and regain control of the situation. When the Captain of the Pacific rather rashly suggested - in jest or not, Benjamin never found out - that they should just blast the Orions away for killing a Starfleet officer, Byrne - who was now manning the tactical station - advised against it. To prevent a diplomatic incident, Byrne recommended that the Orions be taken into custody, and extradited to a court to have justice seen to by the legal system, a recommendation which the Captain took. For his actions in saving the lives of most of the away team, and possibly avoiding a diplomatic incident with the Orions, Ben was promoted to Lieutenant JG, and assigned as Chief Security & Tactical Officer aboard the Pacific, replacing the man killed on the station. As Byrne rose through the ranks, he earned a name for himself, becoming known as a sound negotiator, but firm and decisive when it was required, having a strong knowledge of tactics and ship-to-ship battle operations. By the year 2368, he was promoted to full Lieutenant, having progressed up from Ensign in only two years. It was in this year that he met someone whom he would fall in love with, a woman by the name of Diana Crix, who had transferred aboard the Pacific herself, in the science department. For two years, Dianna and Byrne led a successful relationship together - but then things came to a rapid halt for Byrne's personal life. He walked into their room one day to find her making a covert call to someone in the Romulan government, and confronted her about it. Her cover blown, the Romulan agent really known as T'Marl revealed her true self, stunning the man who had thought he had loved her for two years to make her escape. It took Byrne a long time to get over the situation, and he spent a number of months during 2370 back home on Earth with his family, who showed him nothing but support. It was only his sense of duty which kept him working, albeit in a minor fashion, as he applied for a transfer to an advisory job at Starfleet Headquarters, working for the office of Federation Security. Occasionally he would partake in a few Earth-bound activities of the Diplomatic Corps, but none of his duties were performed with the sense of motivation he had had previously. It was towards the end of that year that Thomas, who was on shoreleave himself to spend time with his brother, and Elizabeth introduced him to Sarah Johnson, in an attempt to cheer him up, and bring some energy back to his life. It worked, too - at first Byrne was sceptical about their plan, but agreed to meet her. On their first meeting, they hit it off famously, being able to instantly make each other laugh, and enjoy themselves. When Byrne was made an offer by Captain MonRoe of the USS Antarctic to assume the position of first officer on board with a promotion to Lieutenant Commander when the threat of the Dominion was first learnt of in 2371, it was Sarah who convinced him to take the post, though only after he made her promise to join him and live on the Galaxy-class starship with him. The Antarctic was assigned the duty of helping to make the Federation prepared for the war that Admirals at Starfleet Command knew was inevitable, and she spent the first few months of 2373 guarding important shipyards where new starship designs were being produced. She was in orbit of one such facility's anchor world when war officially broke out with the Dominion, and Byrne was made another offer, this time by Starfleet Command. They wanted him to assume command of the USS Hendrix, one of the new Defiant-class starships, and join the fourth fleet in the war effort. Byrne accepted on two conditions; firstly, that he was allowed to take Sarah to a strategically unimportant world, where she would be safe from the Dominion's advance, and secondly that Sarah would marry him. The two became newly-weds on the oceanic planet of Pacifica one month later, and Byrne kissed his new wife goodbye as he set off to help the war effort. The Hendrix saw battle on a number of occasions, and managed to stay in one piece every time. When the Breen first entered the war, however, she was caught off-guard by their energy dampening weapon, and completely disabled. Fortunately for her crew, she wasn't destroyed, and was later retrieved and began a refit program to equip her to fight against this new weapon. 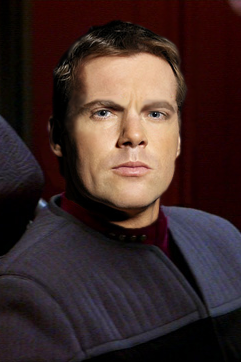 During the ship's refit, Byrne learnt of certain unease amongst a number of Starfleet Command personnel over his appointment to command the Hendrix by Commodore Gates. None of them doubted his record, or his abilities as he had proven them so far, but they felt that at 26, he was too young to be given a command, and too inexperienced. Thomas, who was working as an attaché at headquarters with the rank of Lieutenant, told him that the only reason Gates' decision hadn't been overturned was that they were in a war, and they needed every ship they could get. Besides that, he was only in command of a small vessel, and the Admirals were intending to keep him at Lieutenant Commander until they felt he was old enough and experienced enough to have Gates' decision affirmed by a promotion. Byrne didn't care, all he wanted was to protect the Federation, and to protect his wife Sarah. When the modifications to the Hendrix were completed, he contributed to the war effort with just the same determination as he had shown before the revelations brought to him by his brother. The Hendrix was one of many ships however which did not make it through the rest of the war in one piece. She was destroyed at the battle over Cardassia, losing 6 crew members in the process. After the war had officially come to a close, and Starfleet began assessing its strength, they determined that there were not enough available personnel for him to get another command of his own, and so was assigned back to the Antarctic under Captain MonRoe, to once again serve the man as his first officer, with Sarah finally able to join him on board again. Byrne served under MonRoe for a further 3 years, until he was finally promoted to full Commander and granted command of the Nova-class USS New York in 2378. Only one month after his promotion, Sarah gave him some wonderful news - she was pregnant! The small Nova class was ideal for Benjamin and Sarah, as she was only ever assigned to surveying and scientific missions, with the odd diplomatic function, and so the stress of life raising a child on a starship was fairly minimal, all things considering. That is they were, until 2386 when the New York was caught off-guard by a wanted criminal, hiding in a nebula they were surveying. The criminal thought that the small, fast starship had come in pursuit of them, and so ignited the volatile gases in the nebula, only just escaping himself, and causing a warp core breach in the New York's reactor. 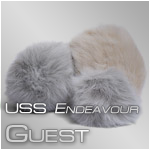 USS Endeavour Later that year, Commander Byrne was offered the third command of his career - this time, a much larger ship; the Sovereign-class USS Endeavour, part of Vice Admiral Sanchez's newly-reformed Eleventh Fleet. Understanding that the large ship was not only a big step upwards in his career, but also a much safer home for his family, Benjamin accepted, and he, Sarah and Jacob moved aboard while he began to search for his crew.